Security codes are the oldest method of securing a data logger. They can effectively prevent innocent tinkering and discourage wannabe hackers—actions that could potentially wreak havoc on the integrity of your data. In this article, I’ll discuss the different security codes and how to use them to secure your data and settings. 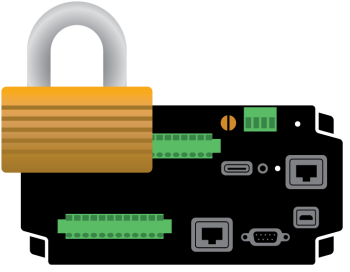 Up to three levels of data logger security can be set. For a CR1000 or newer data logger, valid security codes are 1 through 65535. (0 is no security.) We recommend that you use a unique code for each of the three levels. Using a bank as an analogy, level 3 is the front door to the bank; if it is locked, nobody gets in without a key. Level 2 is the reception area where you can access some information but not all. Level 1 is the vault; with the correct combination to the vault, you have access to everything. Level 1 (the vault) must be set before level 2 (the reception area) can be set, and level 2 must be set before level 3 (the front door) can be set. If a level is set to 0, any level greater than it will also be set to 0. For example, if level 2 is 0, level 3 is also 0. The security levels are unlocked in reverse order: level 3 before level 2 before level 1. When a level is unlocked, any level greater than it will also be unlocked. For example, unlocking level 1 (entering the level 1 Security Code or vault’s combination) also unlocks levels 2 and 3, giving you access to all data logger settings and functions. Cannot change or retrieve the program. Writable variables cannot be changed. Cannot change or set the clock. Writeable variables cannot be changed. After a data logger has security enabled, you can give trusted individuals varying levels of access. 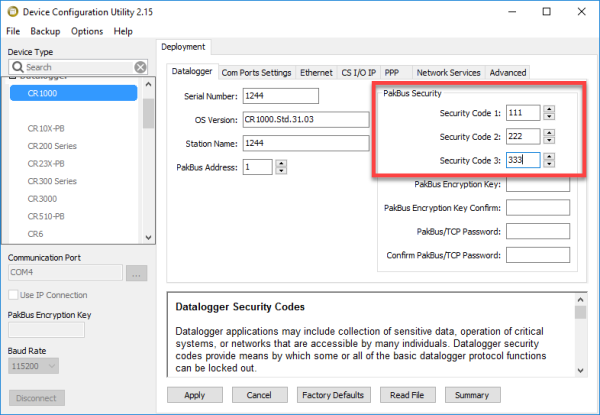 The network administrator (or the person responsible for updating data logger programs and communications) should have the highest level of access, or Security Code 1. In contrast, someone who only needs to collect data can have Security Code 3. 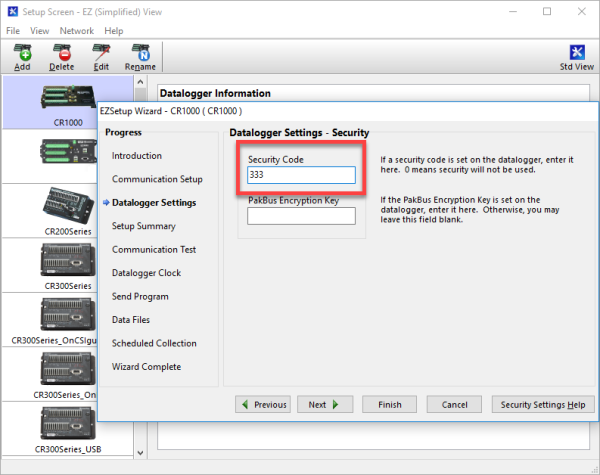 In the EZSetup Wizard, go to Datalogger Settings and click the Next button. Enter your Security Code, and click the Finish button. Data logger security codes are one way to keep control over who can make changes to important data logger settings. It is a good hardware management practice to give people access only to what they need, not more. If you have any questions or comments about setting your levels of security, post them below.